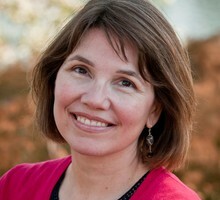 Jessica Martin is the executive producer of OPB original television series "Oregon Art Beat." Jessica has produced numerous local and national productions during her time at OPB, including the long-running outdoor series "Oregon Field Guide," "The Collectors" and "Neat Stuff." Jessica's documentary work includes two award-winning films on aging, as well as two award-winning historical documentaries, "Rose City Remembered" and "The Three Rabbis." Illustrator Lee White finds the essence of Santa in his depiction of a young girl's letters to him in the book "Love, Santa." In Stephanie Brockway's hands, the past life of an object is fuel for the energy in her new art. Portland’s Imago Theatre is famous for their long running, national touring, hit shows "Frogz" and "ZooZoo." But now, Directors Carol Triffle and Jerry Mouwad have created what they hope is a new hit. Every summer, scores of painters descend on the lavender fields of Oregon, creating work, and getting a little aromatherapy as well! A look back at "Oregon Art Beat's" year of animation, natural wonders of light and lack there of, timeless voices and more. Drawn from his childhood memories, Lam Quang handcrafts sculptural lanterns out of bamboo frames and his own handmade paper. Marrying modern choreography with traditional Southeast Asian dance, Minh Tran formed Minh Tran & Company, becoming a prolific choreographer and sought-after educator. The Chinese New Year celebration at Lan Su Chinese Garden introduces us to some cultural activities including the lion dance performance and illuminated lanterns. In its 17 years, "Oregon Art Beat" has traveled all across the state to profile some of the many Native American artists creating work right here in Oregon. Here are just a few artists you should know about. There's never a dull moment (or a dull year, for that matter) for "Oregon Art Beat," and 2016 didn't disappoint. It shaped up to be a treasure trove of the unexpected — as well as a dash of the beloved. Ceramic Showcase, billed as the largest ceramic show and sale in the country, takes place every spring in Portland. New Works by Alumni Artists - featuring painter Betty LaDuke who Oregon Art Beat first profiled in 2006. LaDuke illuminates food Oregon produces, the people who grow it, harvest it and bring it to our tables in a new book Bountiful Harvest. Highlighting Museum of Contemporary Craft’s new exhibition “Living With Glass”, an exhibit that delves into the minds of collectors of glass, what they search for, and what they eventually acquire. Put A Bird On It One More Time With Portlandia! Meet the quirky residents of Portlandia and the creative team that brings them to life.